Libya's Prime Minister-designate Fayez al-Sarraj chairs a Presidential Council of the Government of National Reconciliation meeting with local mayors inside the naval base in the Libyan capital, Tripoli, April 3, 2016. Libya’s U.N.-backed Government of National Accord (GNA) is off to a better than expected start in the few days since its six-strong Presidency Council arrived in Tripoli on board a boat from neighboring Tunisia “promising to turn the page” and restore order to the country. The leader of one of Libya’s two other rival governments has withdrawn obligingly from the Libyan capital, but says he still disputes the GNA’s legitimacy. And the leaders of the other rival government, the House of Representatives (HoR) in Tobruk, are now making conciliatory statements. GNA is meant to be sharing power with the two rivals under a political deal brokered by the U.N. and Western powers. Until recently the HoR’s National Salvation Government was the internationally recognized authority in the fractured North African country. Several mainly Islamist militias that have been controlling Tripoli since 2014 after forcing the HoR to flee the capital have either announced their neutrality or agreed to support the GNA, at least for the time being. This has removed the threat of immediate violence. That in itself is music to the ears of Western diplomats who feared militias might try to sabotage the new government, especially when political rivals closed the airspace over Tripoli, forcing the putative prime minister, Fayez al-Sarraj, and his team to sail to Libya. This image released by the media office of the unity government shows Fayez al-Sarraj, right, upon his arrival in Tripoli, Libya, March 30, 2016. He arrived by sea with six deputies to set up a temporary seat of power in a naval base. “At least they have a foothold now,” said a relieved Italian diplomat. Since the Presidency Council’s arrival, the Libyan capital has been relatively quiet, although gunmen stormed a Libyan television station last week, halting transmissions. 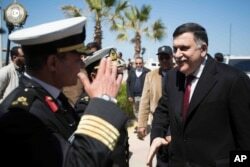 In a show of confidence, Sarraj, 56, the scion of a prominent local family, went on a walkabout in Tripoli over the weekend. Hundreds of supporters rallied in the capital and chanted “Bye-bye, GNC,” referring to the militia-backed General National Congress, which refused to stand aside after the HoR was elected in 2014 in nationwide polls. The refusal plunged the country deeper into turmoil. But as the GNA seeks to consolidate its position in the Libyan capital, let alone expand its U.N.-given authority to the rest of the country, no one is underestimating the challenges that remain for Sarraj. His first priority is to persuade the HoR to ratify the new political setup, and until he does, the GNA remains in legal limbo. Analysts question whether Sarraj’s arrival in the capital will herald a period of stability for a country that has been tottering from one crisis to another since the 2011 ouster of strongman Moammar Gadhafi. The negotiating process for the political settlement wasn’t inclusive enough, warn some analysts, who fear the odds of success are stacked against the new government. Under the U.N. deal, the presidential council is meant to lead a unified government. The HoR will be the main legislature, while a State Council made up mainly of GNC members will be a second, consultative chamber. Elections are supposed to be held within six months. Qatar and Turkey have supported the GNC, while Egypt along with the United Arab Emirates has been supportive of the HoR, and especially of former Gadhafi general Khalifa Haftar, who heads the so-called Libyan National Army made up of former militiamen and veterans from Gadhafi’s security forces. A man loyal to the Libyan armed forces prepares himself for clashes with Islamic State group militants west of Benghazi, March 7, 2016. In the past, Egypt and the Emirates have mounted airstrikes in support of the general’s forces, who have focused on battling Islamic State militants and their affiliates in the eastern part of the country. Al-Ghwell argued that there is a lack of consensus among Libyans behind the GNA, which was shaped after months of fraught negotiations. He fears the GNA will go the way of previous short-lived post-Gadhafi governments — quickly being held hostage by town-based, secessionist and Islamist militias, who he believes are now just biding their time and repositioning themselves politically, waiting to see how the GNA fares. Sarraj has wasted little time in trying to exert authority. With the help of one powerful militia, he has secured the prime minister’s office. On Monday, after gaining the support of the country’s central bank as well as Libya's National Oil Corporation, he ordered “the freezing of bank accounts belonging to ministries, agencies and bodies as well as public institutions funded by the public treasury” as the first in a series of moves to gain control over the country’s finances. Diplomats acknowledge the road will be difficult. Sarraj has to unify a country divided along sharp regional, tribal and ideological lines, and to persuade militias to disband or join a national army, something that eluded a series of previous governments. He also has to ward off the burgeoning threat of IS, which has expanded its reach. The terror group controls Gadhafi’s coastal hometown of Sirte and has a strong presence in other towns, including Ajdabiya, Sabratha and Derna. 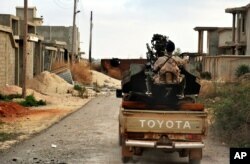 Western officials put the number of IS fighters in the country now at around 8,000, although local anti-IS militiamen estimate the number at 5,000. FILE - Damage resulting from clashes between the Libyan military and Islamic militias is seen in Benghazi, Oct. 29, 2014. Western officials hope war fatigue, the allure of foreign aid and development money, and the IS threat will help build momentum for the unity government and persuade opponents to hop on board. But while Western powers hope Sarraj can persuade the militias to disband, the militias will be needed in the interim to battle IS, a factor that won’t help the new government tilt the balance of power in Libya away from the gun and back to politics. 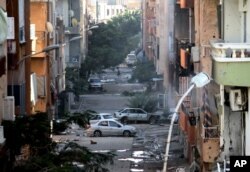 The future role of Western powers in Libya is also unclear. The biggest concern of Washington and nearby European powers such as Italy and Spain is the growth of IS in the country and the opportunity that gives the militants to launch attacks on southern Europe, a short boat ride away. Small groups of Western special forces are in the country, working with militias fighting IS. U.S. warplanes have twice launched strikes on the militants in Libya in recent months, and Pentagon officials say more are in the offing. The GNA needs Western support to establish itself, but a too aggressive Western military role risks angering a wide swath of Libyan opinion, say analysts.